« Does Transition mean firmer buttocks? In a recent interview with Transition trainer Sophy Banks she talks about how doing Transition can feel like having two feet on different conveyor belts moving in different directions. She says “it’s like we have these two systems that are going in opposite directions, the system that’s still trying to get more growth, more material consumption, sell us more stuff … and another system that’s saying we need to put the brakes on, we need to slow down, and living in Transition means you’ve got a foot on both conveyor belts, and there’s a psychological stress in inhabiting those two world views at the same time”. The other day I spotted a great example of this in an unlikely medium, Lego. Lego pride themselves on being able to model most things in Lego, from Hogwarts to Atlantis, but I was fascinated to see that everyone’s favourite plastic block producers and vacuum cleaner bunger-uppers have succeeded beautifully but unwittingly in modelling the tension outlined by Sophy. 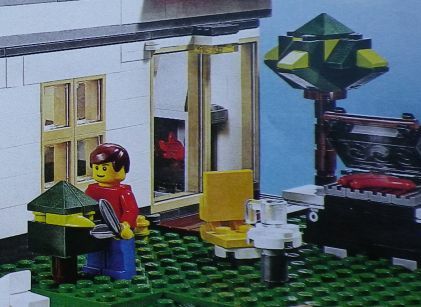 In the latest Lego catalogue, picked up by one of my kids in a toy shop recently, is the ‘Hillside House’. It is a house, presented as, I imagine, the perfect modern home. But what struck me was that this is the first time I have ever seen a Lego house with solar panels on the roof. It felt to me to be one of those junctures, one of those historic moments where you get a sense of a cultural shift beginning to move, the moment when Lego started fitting solar panels to their houses. I feel honoured to be here to see it. 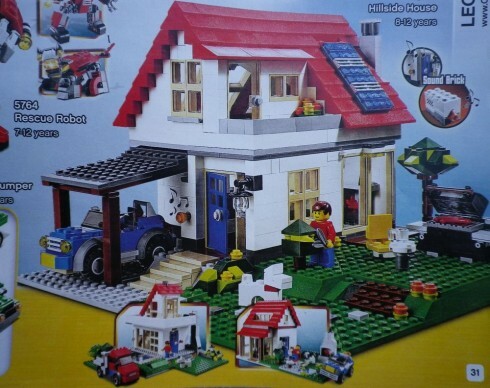 Perhaps, I thought when I first spotted it, Lego have ‘got’ Transition, have ‘got’ the need to model low carbon living in their creations, and are using their new models to subliminally promote a vision of a post oil world. Although the level of clarity one is able to get with plastic blocks doesn’t really allow you to tell if they are photovoltaic cells or solar thermal panels, there they are, unmistakably gleaming on the roof. However, look closer, and our new, enlightened Transition Lego Town starts to come a bit unstuck. They have a barbecue, fair enough, there’s nothing like a good bit of locally produced Lego charcoal, but ah, what’s that behind our smiling Lego man (who isn’t showing much sign of psychological distress)? A Lego paraffin patio heater! (see right). Gah! All of a sudden, this whole Lego setup sets off the feeling of being on the two conveyor belts. Of course it could be a rather odd and angular tree, but it certainly looks far more patio heater to me. It is hard to tell if the car in the picture is a highly efficient electric vehicle charging from the Lego solar panels on the roof, or a gas guzzler, as the size of its tyres might suggest. The windows of the house could indeed be triple-glazed Passivehaus windows, indeed the house could be built to that standard, but the whole picture feels to me to firmly have both feet on different belts, modelling the tension Sophy refers to. We know that the world is changing, that we are entering a ‘new normal’, where renewable energy is becoming a part of everyday life, more woven into the culture, but at the same time things like patio heaters sit alongside them. Personally, I’m looking forward to the Lego raised beds, where you can arrange your produce in the beds. Rocket? Mizuna? Purple sprouting broccoli? It’s all possible with the Lego Incredible Edible range. Vertical veg growing up the walls? No bother. Indeed, it would then enable you to grow food on the roof of your Lego Hogwarts, or on the Death Star. Some nice espalier fruit trees could be good too. Some Lego blocks that look like wany-edged sweet chestnut boards would be great too. You could give your Millenium Falcon some nice rustic touches. Or of course you could just bin it, and build stuff out of mud and sticks. Much more scope for creativity and you could always use old mobile phones as solar panels (or something). The big question though, is whether the recent changes to the Feed in Tariff, which many argue has damaged the future of the solar industry, will lead to a reduction in Lego solar installations? I will watch future catalogues with great interest. I can see great scope here for Transition and Lego to design some much needed educational eco toys for places like the Early Learning Centre, who value creativity and try to down play war toys. I think a set of well thought-out Transition Towns, as toys made from recycled plastic, would inspire the Primary school age child and provide opportunities to understand the ramifications of living in a low carbon eco friendly world. That’s brilliant, very funny, I wonder if a lego parliament exists, lego eco activists could head down to legoland and retrofit historic buildings with the new solar panels and other renewable tech lego paraphenalia! Maybe in Denmark, where lego is designed, solar panels are now fairly common, so that would explain why they’re also on a non-recycled (but very re-usable) plastic lego house too! But creatively speaking, you know those fantastic Lego-Star Wars/ Lego Withnail & I animated clips on you tube? (the one with Eddi Izzard voice-over is just the best!) – well it would be so cool if someone came up with a Lego-Transition Towns one (or series of them) too… hay maybe we can even persuade Eddi to do the voice-over on that too!! I used to design custom LEGO sets and it would sure be fun to combine that with Transition. Hmmm…. I was similarly impressed on seeing the roof of the new Playmobil farm set as seen in a Brecon toy shop recently. Hoping for a forest garden to be added to the the 2013 edition…. In real life I am in the middle and we have no transition no one interested and it is so hard and I feel like I live in Lego land here in me brick house! Unfortunately this Lego model too clearer reflect the real world as i see. Most who have some form of solar on their roof only have them for one reason, and that is neither the planet nor Transistion. They only see a good place to put their life savings. With next to no interest from bank accounts, turning your house into a power station seems like a good long term investment. If they where interested in the Green issue they would have downsized from the 4/5 bed, 2/3 bath homes, or at least turned the acre of pristine lawn over to growing food.